417 18th Street Beautifully finished two-family townhouse with a large backyard This two-family home currently used as one has sophisticated finishes and high ceilings throughout. Flooded with south facing light, the open-plan parlor level living room flows seamlessly into a dining room which comfortably seats six and has a convenient wine fridge. The stunning chef's kitchen is loaded with luxury details including an extra wide double door fridge and freezer, a six burner 36" Viking range with two ovens, a griddle and a powerful vented range hood, a dishwasher, granite counters and ample cabinet space. A large window over the sink overlooks the 55 ft deep fenced garden with a deck, a bluestone patio with built-in seating, low maintenance high-end artificial grass, and a charming pergola under two gorgeous maple trees, ready for you to host the party. High ceilings, dark stained Brazilian wood flooring and natural sunlight continue on the upper level, where the master bedroom has 7 ft high double windows and a walk-in custom closet. The second bedroom also has a custom closet and overlooks the quiet neighboring gardens. The large central bathroom has a bright skylight, a luxurious whirlpool spa bath and a separate shower. The basement level has large double front windows and a separate entrance and is currently used as a guest bedroom and play space but could accommodate an independent studio apartment. It features high ceilings, a full bath and a full-size laundry room with folding space and ample extra storage. All mechanical systems are well maintained, including the high efficiency central air conditioning, a tank-less and endless hot water heater, water filtration system, windows, and security system. 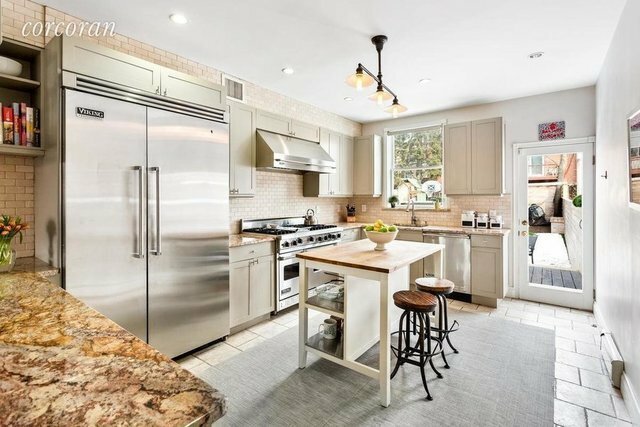 With great street parking on a tree lined block, this house is conveniently located to the F/G or R trains, Prospect Park, the South Slope dog run and all the independent shops and restaurants of 7th avenue and Prospect Park West.